Be a source for first-hand, skis-on-the-snow, evaluations of current ski conditions, primarily at Gore, but at other local ski areas as well. I ski with my family just about every weekend, from opening day in November to closing day in April, and it's my goal to provide readers with an independent and more in-depth account than what is available from ski areas' snow reports. Promote and support the ski areas and ski-related businesses in the Saratoga and Adirondack region. I want to use my blog to build awareness of these resources. It's a way for me to capture and preserve memories, a journal or scrapbook of sorts. The Saratoga Skier and Hiker is completely independent. I am not endorsed by or affiliated with any ski area or trade association, and accept no advertising. 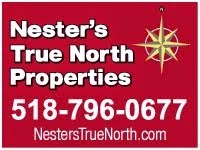 The "ads" for local ski areas and businesses are links that I've added to help promote those establishments. The internet is anonymous, and that's not always a good thing. I post on this blog and elsewhere using my real name because I beleive enough in what I write to put my name on it. Readers of this blog are encouraged to comment using an identifiable name, although anonymous commenting is allowed. I tend to have a pretty positive outlook on the recreational activities I pursue, but I also try to be honest in the reports I post here. If the skiing is icy and the slopes are crowded, I'll certainly say so. But I'll likey devote more of my report to describing how I found ways to still have fun. I am a participant in The Saratogian's Community Media Lab, and occassionally contribute material to The Saratogian, Adirondack Almanack, and Adirondack Sports & Fitness.